Cover photo by François Carrier. It took a while for this one to come out, after a number of false starts since it was first considered for release a few years ago... 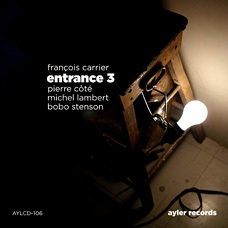 This fantastic concert by Canadian sax player François Carrier is finally available. His trio with Michel Lambert on drums and Pierre Côté on double bass was joined that afternoon by Swedish pianist Bobo Stenson, for a set of powerful and joyful music, recorded during the 2002 Vancouver Jazz Festival.